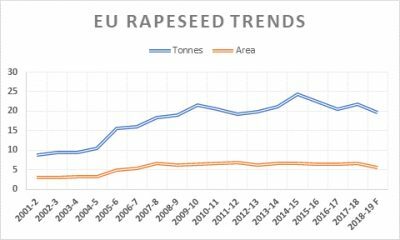 AUSTRALIAN shipments of canola from its 2018 crop got off to a flying start in November with cargoes bound for crushers in Belgium and Germany providing the bulk of the 155,013 tonnes shipped, according to the latest export data from the Australian Bureau of Statistics (ABS). Australian Oilseeds Federation executive officer Nick Goddard said dry conditions in the EU saw reduced yields in its harvest in July-August, and European crushers have stepped up to take Australia’s first new-crop shipments to help fill the shortfall. “Their demand for imports was strong, and they have been able to take advantage of the Australian harvest in October-November to bolster their supplies,” Mr Goddard said. This expectation, and resulting firmness in prices, has encouraged farmers in Ukraine and other former Soviet countries, to increase their plantings, which will not be harvested until the European summer. Mr Goddard said firm bids from the EU have given Australian traders little incentive to compete with Canada in some Asian markets. The most recent AOF forecast pegged Australian canola production at 1.96Mt, the lowest in 10 years, with Western Australia alone expected to produce 1.42Mt. Australia typically uses around 1Mt of seed for its domestic crush centred in New South Wales and Victoria, and has already sourced South Australian and Western Australian new-crop seed to bolster its intrastate supplies. The closure last year of Cargill’s cottonseed-crushing plant at Narrabri means canola meal in eastern Australia has met increased demand, and the ongoing drought in NSW particularly could boost domestic consumption from the stockfeed sector. This could further reduce Australia’s export surplus. Table 1: ABS canola export figures for September, October and November 2018.